Due to their persistently good performances in the German Bundesliga, the top tier of the German football league system who also gains a relating economical success, the UEFA Champions League participant Bayer 04 Leverkusen, invested in its stadium and optimized its infrastructure. Acting in conjunction with YouCard, the club designed and established a new and innovative ethernet based encoding system for its BayArena-card. Whether their fans and clients aspire to purchase merchandise and several other goods in the stadium, like drinks, jerseys or snacks in the Bayer branch or in the official fan shop, all card printers are connected with each other via ethernet. 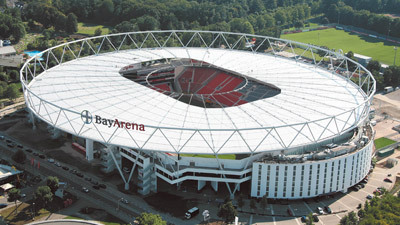 Because of that, it is possible to print the BayArena-card at every selling point. It is also noteworthy that this multifunctional card is a season ticket and a member ID card also. This means you can pay snacks and beverages while you get access to the stadium with only one card solution. “Insbesondere die mehrtägige Betreuung vor Ort während der Einrichtung und Installation unter Zeitdruck sowie die telefonische Betreuung während des gesamten Projekts waren erstklassig. Alle Drucker laufen sehr gut und auch die Druckqualität ist einwandfrei”. Cashless payments can contactlessly be processed within seconds. That is also why it is possible to avoid long waiting periods at rush hours. All you have to do is simply touch the card reader with your BayArena-card and that’s it! 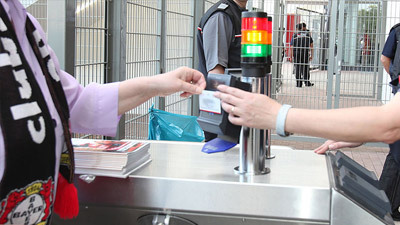 What is more, the BayArena-card can also be used to pay outside of the stadium and in the Bayer 04 Leverkusen online shop. Our unique ethernet based BayArena-Card: An innovative and flexible card solution!